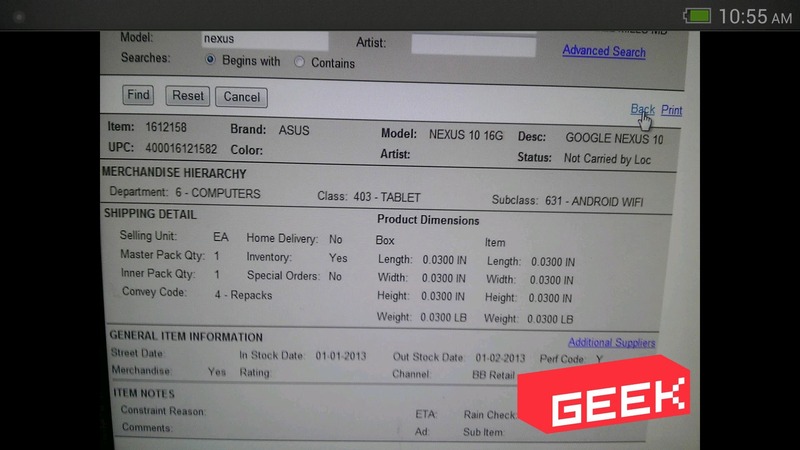 According to Geek.com's Russell Holly, the successor to the Nexus 10 - which will be called the Nexus 10 - will be manufactured by ASUS, not Samsung. Holly bases his belief on information from "multiple sources" and an internal Best Buy inventory listing, a well-known Nexus retail partner. Here's that inventory listing, which has otherwise generic "placeholder" info (aka don't pay attention to the obviously-wrong release date). Now, my first thought was "well, this directly contradicts an earlier report from a reliable source," allegedly Google's own Sundar Pichai, as spoken to by the Wall Street Journal's Amir Efrati, who has since left his post at that publication. Here's the tweet, published about two weeks ago. Call me crazy, but I'm not seeing a lot of room for interpretation there. As of this morning, though, there is apparently lots of room for interpretation. @PDTalkinTech The perils of reporting via tiny tweet. Should have read "(currently made by Samsung)." Sundar didnt specify maker. Why the sudden change of heart 2 weeks after, I don't know, every single major tech publication posted that first tweet as a confirmation that Samsung would be the OEM? It doesn't really matter, because we can now basically toss that earlier rumor out. Holly's track record with upcoming Android features and hardware has generally been pretty spot-on, so I'm not too inclined to skepticism here. It makes sense, after all, given the wide success of the ASUS-made Nexus 7, and the continued Google / ASUS partnership on the new Nexus 7, unveiled late last month. Also, given some of the issues that continue to plague the Exynos 5-powered Nexus 10, the most notorious being random reboots, Google may not be feeling another Samsung partnership right now. Holly says we can expect the device in time for the holidays, on the Play Store and at Best Buy. No details about the hardware itself were revealed.